Vancouver is going through a cold spell and when I stepped outside today, the frost on the ground was thick and full of sparkles. It’s the kind of cold where you can see your breath and I’m amazed that there isn’t any snow (though they are forecasting some for tomorrow). We’re packing on the sweaters but it’s not enough. So when I thought about dinner, I looked through the crisper and spied the usual winter staples: yams, cabbage, onions. In one of my Moosewood cookbooks I found a recipe for West African Groundnut Stew and decided that I’d use the basics but add my own twist: unique spices ranging from cardamom, cinnamon, tumeric, cumin, coriander. The flavours were complex and interesting and it reminded me of one of my favourite soups, this African Yam & Peanut soup, but less rich and heavy. The resulting stew was delightfully belly warming, the perfect meal for a cold winter’s eve. elsewhere: Over at ReadyMade check out my latest post on being a mindful eater – probably useful for all your new years resolutions. In a large heavy pot, melt the coconut oil and add in the onions, ginger, cabbage, yams and spices. Saute for 5 minutes and then add in the tomatoes and apple juice and cover pot. Let simmer for 20 minutes or until the yams are soft. If you find the stew a bit dry, add in more apple juice. Add in the peanut butter and lime juice and stir until combined. Serve over rice, millet or your favorite grain of choice. This looks like a great winter dish! I’m always looking for more ways to utilize cabbage in my cooking, too. I may need to give this a try. Oh wow, this sounds awesome. Perfect for a snowy weekend — Imma have to bookmark this! Sounds like a great way to warm up when it’s chilly out. Congrats on your award! You rock! Oh, yum, this looks tasty. It reminds me of another peanut stew, this time with turkey, which is a nice, warming addition. Thanks for the reminder of a great winter meal. This is exactly the kind of recipe I need right now…super healthy and super comfort food. Delicious! Sounds perfect for these chilly days! Like Amy, I want to incorporate more cabbage in my diet, too. I have read a lot of books lately about Africa and have seen “groundnut” in many of them. I did not realize it could refer to a peanut. This recipe looks delicious. Our family lived in West Africa for a couple of years. Mother learned how to make the groundnut stew (Lisa – you are right, groundnuts is what they call peanuts). Ours had chicken, chicken broth, coconut cream/milk, peanut butter, onions, garlic, curry powder and other spices. No cabbage or tomatoes. The stew was served over rice. Then the fun started. There would be a variety of small dishes filled with diced bananas, oranges, pineapple, hard boiled eggs, nuts, grated coconut, chutney etc. On the plate would go the rice, topped with the stew and around the plate would be a spoonful of each condiment. One would take a forkful of rice, stew and one condiment. The next bite would be another condiment. Sometimes we would eat out on Sundays at the club and it was common to have 50 different condiments to choose from. Hurray, I bought a cabbage today so I can definitely make this. It sounds delicious! I also love the African yam and peanut soup. It’s amazing! Amy, please do and check out all my cabbage archives for inspiration. If there’s one thing I’m not afraid to use, it’s cabbage. Sarah, thanks for the link and yup, it’s a perfect winter meal. 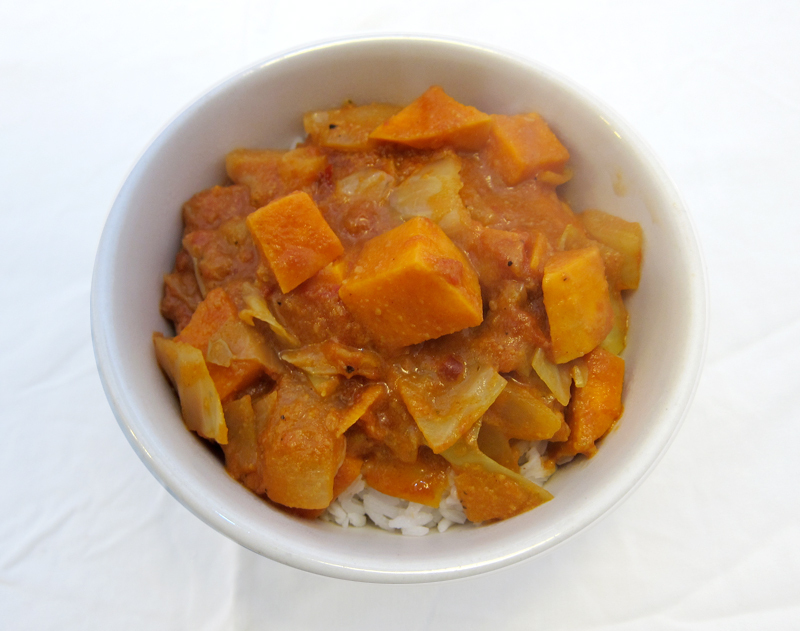 Joanne, it’s perfect comfort food – but healthy and also full of interesting flavours. Nicole, don’t be shy – cabbage is awesome. Take a look through my archives! Indeed, peanut equals groundnug, Lisa. Enjoy! Maureen, in the Moosewood cookbook they do suggest that you serve this with many of the condiments you list. And I love the sound of a chicken/coconut/peanut butter stew! I’ll be trying that soon for sure. Bijoux, I know you’re a fan of the soup, and this is a nice twist on similar flavours. Thanks Alexis, it definitely is – and healthy too! Chelsea, what’s up with this west coast cold snap? Today is warmer…but there is now rain. Oh well! I am on my way to Vancouver now! I brought all my winter clothes, so hopefully I stay warm. 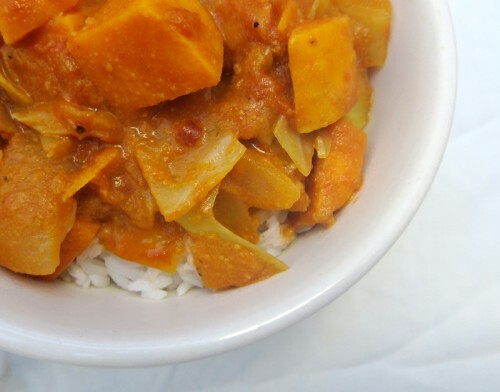 I love love love Moosewood and this recipe and made it before I left to stay warm in SF. I am also planning a trip to Ithaca just to go to the restaurant. I’m a nerd, I know! oh, how i loved our time in your lovely vancouver. 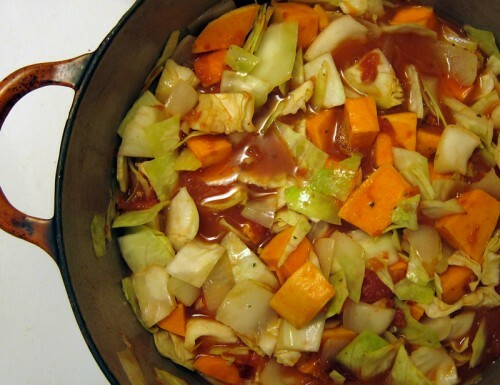 this stew looks wonderful…hitting the spot for a winter’s night! This sounds so comforting on a warm night. I keep meaning to try coconut oil in my cooking but I absolutely despise coconut! It’s very strange. All it makes me think of is suntan lotion. However, I am trying to break out of my prejudices- is the flavor powerful or mild? No kidding about the cold Eva! Definitely give it a go. Kasey, oh no, you’ll hate the cake I just made. But as for coconut oil, for me I was disappointed because it doesn’t taste like coconut. No fear, there’s barely (if any) coconut flavour here. So glad I could jog your memory, Mamasue123! Hope you make it sometime soon. this looks so unique and tasty with the apple juice and a bit of peanut butter – must try!